Boulder County is concerned about the potential for significantly expanded oil and gas development within the county. We support appropriate tighter restrictions and increased local control to mitigate the impacts of these activities. The Board of County Commissioners and staff have laid the groundwork for how the county will work to address the potentially hazardous impacts of oil and gas development on local public health, safety, and the environment. In order to maximize the use of its limited local authority and protect county residents, Boulder County is committed to undertaking a series of legislative, legal, environmental, and public health approaches to help minimize the impacts of oil and gas development on people and the environment. View details of the county’s multi-pronged approach. The County Commissioners adopted the strongest set of regulations on oil and gas development in the State of Colorado on March 23, 2017. Boulder County is committed to protecting our open space from oil and gas development to the greatest extent possible. Read the county’s Statement on Oil & Gas Development on Open Space for additional details. Boulder County as a whole is very active in addressing the impacts from existing and new oil and gas development, including impacts to air quality and public health. Boulder County Public Health has specifically undertaken and supported studies and analyses to understand the potentially hazardous impacts of oil and gas development on public health, safety, and the environment. Public Health is also involved in local and state-level oil and gas emissions regulatory processes in the interest of preserving public health. Natural gas can exist in rock and soil. These gases can filter into buildings and homes. A home gas detector can measure the amount of gas in a home’s air. On April 3, 2019, the Director of the Colorado Oil and Gas Conservation Commission (COGCC) announced that the Commission’s April 29-30 hearing at which the Crestone Comprehensive Development Plan (CDP) was to be heard will be postponed and rescheduled. Due to changes to the makeup of the COGCC made by the April 3 passage of Colorado SB19-181, the Director postponed the April COGCC hearing until the effects of those changes are understood and implemented. Because of the postponement, the April 9 COGCC public comment session that had been scheduled specifically for the CDP will also be cancelled. Boulder County will publicize further details on the rescheduled COGCC Crestone CDP hearing as soon as the information is available. Sign-up for text or email news alerts. On Feb. 14, 2019, the District Court ruled (view ruling) that the county must wait until permit processes proceed to file some claims. Read more. On Dec. 17, 2018, the Colorado Oil and Gas Conservation Commission (COGCC), by a vote of 6-2, reversed the order issued by the Hearing Officer to postpone the hearing on Crestone Peak Resources’ Comprehensive Drilling Plan (CDP) pending the outcome of the County’s lawsuit against Crestone. This means the hearing on the CDP and its associated drilling and spacing units will be scheduled for a future COGCC hearing, date to be determined. Read more. After the COGCC postponed the Crestone CDP hearing, Crestone filed an “Exception,” asking the full COGCC Commission to reconsider the order issued by the Hearing Officer. During the December 17-18, 2018 COGCC hearing in Denver, the County, Crestone, and the City of Boulder will participate in oral argument to the COGCC commissioners on whether they should uphold or vacate the order continuing the CDP hearing indefinitely pending the outcome of the County’s lawsuit against Crestone. The agenda for that hearing will be posted on COGCC’s website and public comment can be offered in person on December 17 and online (view COGCC Public Comment Process information). The County recently learned that the COGCC does not consider public comment part of the official record unless the commenter is first sworn to tell the truth. If members of the public are concerned about this, they can ask that the COGCC first swear them in before making their public comment or, for written comment, include an affirmation with notarization. Boulder County requests that the State reject or place the permits on hold. Read more. Boulder County requested that the COGCC postpone its hearing on the CDP pending the outcome of its lawsuit filed Sept. 25, 2018. Read more. Boulder County filed lawsuits in Boulder District Court on Sept. 25, 2018, against two oil and gas companies: Crestone Peak Resources and 8 North LLC (a subsidiary of Extraction Oil and Gas). Read more. View the Response to Prehearing Statement. Lawsuit appeals the COGCC’s approval of 8 North’s applications for drilling and spacing units and additional well density in two areas of eastern Boulder County. Read more or view the complaint. The Board of County Commissioners has adopted a position (Resolution 2018-101) to OPPOSE Ballot Initiative #108 (Amendment 74) “Just Compensation for Reduction in Fair Market Value by Government Law or Regulation,” a citizen-generated initiative funded by the oil and gas industry that proposes to amend the Colorado constitution to drastically limit state and local government regulatory authority. Read more. The Protest and Intervention ensures that the county will be a full party to the CDP hearing scheduled for Oct. 29-30. Read the article. Read the statement by the Board of County Commissioners. “While the drilling and spacing unit applications that we filed back in September 2017 include a subsurface area that extends westward to Lafayette, we want to be clear that, contrary to rumor, we currently have no plans to locate an oil and gas development surface site for these applications anywhere within the Lafayette city limits, let alone next to the Pioneer Elementary school as some have suggested. In the spirit of transparency and partnership with the communities where we live and operate, we did not want there to be any confusion around those plans.” – Eric J. Christ, Vice President, General Counsel and Corporate Secretary – Extraction Oil & Gas, Inc.
Public concern has grown in Boulder County regarding the health and safety implications of emissions from oil and gas activity. Boulder County has implemented a voluntary oil and gas inspection program in order to respond to this concern. Inspections have collected data on gaseous leaks and repairs since 2014, and an analysis of this data is now available: view the Boulder County Voluntary Inspection Program Results 2014–2016. On June 29, 2017, Boulder County, along with San Miguel County, City of Boulder, Gunnison County, NWCCOG, City of Lafayette, and Town of Erie filed an amicus curiae brief in COGCC v. Martinez. The case involves a determination by the Colorado Court of Appeals that the Colorado Oil and Gas Commissioner must consider public health and safety when considering proposed state rules for oil and gas development. The COGCC and the oil and gas industry have asked the Colorado Supreme Court to review the court of appeals’ decision. The County and other jurisdictions argued that the Supreme Court should not review the court of appeals decision because government regulations should always protect the public health and safety. July 20 Meeting Agenda for the Air Quality Control Commission (includes the state’s Air Pollution Control Division requesting the Commission set a rulemaking hearing to consider revisions to EPA’s Control Techniques Guidelines for the Oil and Natural Gas Industry (CTGs). Meetings will be posted as scheduled. Sign up for oil/gas email news for meetings notifications. Public meeting for the Board of County Commissioners to discuss approaches, other than local land use regulations, to reduce the impacts of oil and gas development in Boulder County. The meeting was webstreamed and archived (select Event Bookmark #9). Public Meeting of the Board of County Commissioners (BOCC) to consider proposed Land Use Code amendments addressing oil and gas development within the Boulder County Land Use Code. Public testimony regarding this item was taken at the BOCC public hearing on March 14, 2017. Action Requested/Taken: Discussion and action. The Board of County Commissioners voted (3-0) to approve the proposed regulations as one part of a multi-pronged approach to address oil and gas in unincorporated Boulder County. Public Hearing for the Board of County Commissioners to consider proposed Land Use Code amendments addressing oil and gas development within the Boulder County Land Use Code. Public testimony was taken.Since the March 14 public hearing included several hours of testimony, the County Commissioners did not schedule a deliberation/decision meeting as part of the March 14 hearing. The deliberation public meeting was scheduled for March 23, 2017, where they discussed their findings from the public hearing and considered new oil and gas regulations for unincorporated Boulder County. No additional public testimony was taken on March 23, 2017. Action Requested/Taken: Discussion. After several hours of public testimony, the Commissioners gave staff direction to make additional changes to the draft regulations for consideration on March 23, 2017. Board of County Commissioners public hearing, Dec. 13, 2016 – The Board of County Commissioners (BOCC) considered the status of the temporary moratorium that was due to expire the end of January 2017. County staff requested a time period of approximately four months to finalize and implement new oil and gas regulations based on direction given by the BOCC on Nov. 15 and 17, 2016. Staff stated that they would need time to research and draft many of the additional provisions requested by the Board and to prepare to implement and administer the regulations. The Board extended the existing moratorium on new oil and gas development to and through May 1, 2017. View the announcement. Resolution 2016-137, Extending the Moratorium on Processing Oil and Gas Development Applications first Enacted by Resolution 2016-65. See announcement. Additional public meetings and hearings will be posted when scheduled. Board of County Commissioners public meeting, Nov. 17, 2016 – The Board adopted Resolution 2016-130 formalizing the moratorium extension through the end of January 2017 and established December 13 as the date on which a public hearing regarding the moratorium’s status will take place. Staff will provide an estimate of the time needed to complete the requested research and develop amendments to the proposed regulations at the Dec. 13 public hearing. Board of County Commissioners public hearing, Nov. 15, 2016 – After several hours of public testimony, the Commissioners gave staff direction to further inquire into and develop changes to the draft regulations. Since this work cannot be completed by Nov.18, when the current moratorium was set to expire, the Board voted 3-0 to extend the moratorium on an emergency basis until the end of January 2017 so that a public hearing could be set to determine the status of the moratorium (i.e., if and how long to further extend the moratorium based on staff’s estimate of time regarding the necessary work to be done). B) recommend that the Board of County Commissioners continue with a multi-pronged approach to addressing oil and gas development and consider a temporary moratorium on the processing of the required development plans for local oil and gas permits, for a period of time less than 5 years, to craft additional regulations based on new and recently published studies. No further testimony was taken. Planning Commission public hearing, Oct. 12, 2016 – Public comment was taken. Boulder County has submitted a Protest and Intervention to the Crestone final CDP (submitted to the COGCC on June 15). The Protest and Intervention ensures that the county will be a full party to the CDP hearing scheduled for Oct. 29-30, with the ability to present evidence and make legal arguments. The county raised several issues in its Protest and Intervention, from legal challenges to the process and the information Crestone has provided, to site-specific concerns including impacts to residents, agricultural lands, ecological resources and flood risks in the CDP area. View the Protest and Intervention to the Crestone final CDP. On July 30, 2018, the COGCC Director made her Finding of Suitability of Crestone Peak Resources’ Final CDP. With this Finding of Suitability, the COGCC Director has requested the Final CDP be placed on the COGCC Commission’s agenda for the October 29-30, 2018 hearing in Denver. View the COGCC Director’s Finding of Suitability. Boulder County submitted formal comments on the Final (Fifth Draft) CDP to COGCC on Friday, July 6, 2018. View map of Final CDP proposed well sites. Originally the CDP application was expected to be docketed for a COGCC Commission Hearing in September at an “Away Hearing Location/TBD” unless protested by intervening parties. Boulder County formally requested the hearing be moved to a date certain at a local location (Denver) so that stakeholders and the public have certainty on the location and date. If the COGCC Director files the CDP with the Commission on July 27, the COGCC Commission Hearing on the CDP will be scheduled for October 29 or 30, 2018 in Denver. Public comments can be submitted June 20 to July 8 through COGCC’s Public Comment Portal. The Public Comment period for the Final CDP Package closes on July 8, 2018. View map of Final CDP proposed well sites. Telephone Town Hall Meeting for CDP Area Surface Owners – June 27, 2018 from 6-7 p.m.
Crestone Peak Resources will host a surface owner meeting via telephone town hall to review the Final CDP package on Wednesday, June 27 from 6-7 p.m. Registration is required for this meeting. RSVP by emailing cdpboulder@crestonepr.com and provide the phone number that you would like to be called at. You will receive a confirmation email with more information about the call once your registration is received. The meeting provider will reverse-dial meeting participants at 6 p.m.
COGCC revised the CDP timeline to allow time for continued negotiations and evaluation of potential locations. A “Final CDP” will be posted to the COGCC website on June 20, 2018, followed by another public comment period June 20-July 6. If the COGCC Director finds the Final CDP satisfactory for presentation to the Commission, the CDP application will be docketed for the regular COGCC Commission Hearing in September. Since the September 17 and 18 COGCC hearing is at an “Away Hearing Location/TBD,” Boulder County has requested the hearing be moved to the October 29 and 30 COGCC hearing in Denver. The Final CDP Package will not be posted to the COGCC website on April 30, 2018 as previously planned. As part of the iterative process of developing the Comprehensive Drilling Plan (CDP) in Boulder County, COGCC is extending the timeline to allow Crestone Peak time to conduct a further evaluation of the location proposed in Section 1 of T1N R69W. A new timeline and additional details will be posted on the COGCC’s website shortly. Crestone Peak will hold a telephone town hall meeting on Wednesday, April 4, from 6-8 p.m. The meeting will focus on the fourth draft preliminary CDP that will be publicly available on Friday, March 30 on the COGCC’s website. Registration is required for this meeting, so if you would like to participate, please RSVP by emailing Crestone Peak at cdpboulder@crestonepr.com and providing the phone number to be reverse dialed for the meeting. You will receive a confirmation email from Crestone with additional information about the call once your registration has been received. Crestone is requesting that you RSVP for the telephone town hall by 12 p.m. on April 4. COGCC again revised the CDP process and timeline to allow time for continued negotiations and evaluation of potential locations. A Fourth Draft Preliminary CDP will be posted to the COGCC website on March 30, 2018, followed by another public comment period March 30-April 15, including a minimum of one (1) public outreach meeting. The Final CDP will be available to the public on April 30, with written public comment accepted April 30 – May 13. If things go as scheduled and the COGCC Director finds the Final CDP satisfactory for presentation to the Commission, the CDP application will be docketed for the regular COGCC Commission Hearing on July 30. On Friday, Dec. 15, Crestone submitted revised locations of the well pads in the Comprehensive Drilling Plan (CDP) area. A complete Third Draft CDP package, which will highlight any Plan modifications, will be available on COGCC’s website for review on Dec. 29. Given these changes (and per Boulder County’s requests to COGCC), the remaining timeline in the CDP process has also been revised and extended accordingly. There will be a written public comment period Dec. 29 – Jan. 19 on the Third Draft CDP, as well as an additional public outreach meeting held by Crestone. A Final CDP will then be submitted and available to the public on Feb. 2, followed by another public comment period Feb. 2 – 19. If things go as scheduled, COGCC is expected to hear the CDP application at their April 30, 2018, regular Commission Hearing. Boulder County submitted formal comments on the Second Draft Preliminary CDP to COGCC on Friday, Dec. 8. Boulder County staff met with COGCC and Crestone Peak on Nov.9, 2017 to “meet and confer” on the first draft preliminary CDP as required by the COGCC’s CDP Application Process and Timeline. Boulder County submitted formal comments on the First Draft Preliminary CDP to COGCC on Nov. 10. On Feb. 22, 2017, Crestone Peak Resources Operating LLC filed an application with the Colorado Oil and Gas Conservation Commission (COGCC), asking approval of a “Comprehensive Drilling Plan,” or CDP, in Boulder County. A CDP is a preliminary step toward oil and gas development that attempts to plan for development throughout a large area. Crestone’s CDP covers 12 square miles (view map) in eastern Boulder County, between Longmont and Erie. Crestone’s CDP application contains few details on its plans; it has said it intends to develop the substance of the plan over the next 6-9 months, with input from local governments, state agencies and affected landowners. The application does call for a maximum of 216 wells divided among a maximum of 18 separate well pads throughout the CDP area. In addition, Crestone asked the COGCC to put a hold on accepting any applications to drill in the CDP area while the plan is developed. Two other operators, 8 North LLC and Kerr-McGee, opposed the hold request, but on April 30, 2017, all three operators agreed to a nine-month voluntary standstill on filing any permit applications for the CDP area with the COGCC. The final CDP is now expected to be in front of the COGCC in February 2018. County staff is well aware of the significant concerns raised by large-scale drilling in the county and is committed to doing all it can to avoid or mitigate any impacts involved with the CDP. County staff from all affected departments, including the Land Use Department and County Attorney’s Office, is taking advantage of every chance to gather information on Crestone’s plans, and the plans of other operators and stakeholders, and to provide input. Staff has pushed for further information (see letter from Boulder County to COGCC regarding Process for Rule 216 CDP Determination, July 7, 2017) on how the processes for developing and approving the plan will be conducted and when and how the public can give input (see letter from Boulder County to COGCC regarding Crestone CDP Public Meetings, Oct. 10, 2017) and will make all information received available to the public. Whether or not the CDP is ultimately approved, Crestone and any other operator will be required to go through the new Boulder County regulatory process before beginning any development. See the COGCC Crestone Peak Comprehensive Drilling Plan webpage for more information, including Description and Timing of Process, CDP Plan Elements, and Map of Proposed CDP Area. The major documents filed in the CDP process can be found at the bottom of this page. Interested constituents with questions or concerns about the Crestone Peak CDP should contact Rebecca Treitz at COGCC (Email: rebecca.treitz@state.co.us / Phone: 303-894-2100 x5173) and/or Crestone (Email: communityrelations@crestonepr.com / Phone: 720-410-8537). Public comments can be submitted to COGCC through their Public Comment Portal. On Sept. 14, 2017, Crestone Peak sent letters to landowners in the CDP area. In the letter, Crestone stated that Boulder County will be holding public meetings regarding the CDP process. This was a misstatement. The CDP process is led by the COGCC, which has required Crestone to hold two public meetings in the CDP area between October 16 and November 3 (see COGCC process). Boulder County is a stakeholder in the state-led CDP process, along with other governmental agencies and landowners. If Crestone submits applications for Special Use Review (under Boulder County Land Use Code Article 12 regulations) to drill in Boulder County, public hearings will be scheduled and organized by the county through the county’s local review process. The county will share information we receive related to the CDP on our oil and gas website; however, it is Crestone’s responsibility to provide information to the public during the CDP process and to take public input (which will also be taken by the COGCC). On August 9, 2017, the COGCC posted a timeline and outlined a specific process for its analysis of Crestone Peak Resources LLC’s application for a Comprehensive Drilling Plan (CDP). Information about this state-led process is available on the COGCC website. Using this information, county staff and members of the public can now anticipate when Crestone will submit more detailed information on its application and when public comment will be accepted. COGCC requires Crestone to hold at least two public meetings that include all surface owners in the CDP area and there will be ongoing opportunities to submit written comment to COGCC as Crestone revises its plan from conceptual to preliminary to final between September and December of 2017. Boulder County staff and commissioners have received numerous questions about the CDP process and how residents and the county can most effectively participate. The county will keep residents informed about any developments it becomes aware of as the CDP moves forward. However, residents should keep in mind that COGCC is responsible for the CDP and it considers the county a stakeholder, not a decision maker. In contrast, the county has full decision-making authority when it applies its Article 12 regulations to a county application. Because the state-led process does not replace the local regulations, even if COGCC approves a CDP, Crestone will still have to apply for and receive a permit from the county under county regulations. In that permit process, the county commissioners would likely review the same drilling projects contained in the CDP application with COGCC, but the county will apply the rigorous standards and criteria of its own Article 12, not COGCC’s rules and requirements. Because the county commissioners will be required to act as a regulatory body during the county’s Article 12 process, they cannot take a position on specific proposals within the CDP without compromising their regulatory position. Moreover, it would be difficult, if not impossible, for the commissioners to give any substantive input on specific proposals or well locations without all of the information, consultation, public review, and multi-body consideration required by Article 12. Therefore, during the CDP process, county staff from all relevant departments will be providing information to COGCC as relevant to the CDP application, but it will be unable to engage in the analysis that will take place under Article 12 with all of the associated opportunity for input from experts and the public. County staff is available to receive thoughts and comments from the public during the CDP process, but Boulder County urges all interested parties to submit comments on Crestone’s proposal directly to COGCC in writing and at all public meetings and proceedings. The County’s website and staff will provide available information for how to participate in the process and available resources for residents to formulate their responses. Thank you for your input and your continued participation in these processes. Boulder County’s Rule 510 Statement, submitted April 21, 2017 in advance of the May 1 COGCC hearing on the standstill issue – Operators 8 North and Kerr-McGee filed substantial protests to Crestone’s request for an interim hold on drilling applications at the COGCC. County staff believe such a hold is to the County’s benefit and therefore filed the following statement for the COGCC’s consideration at its May 1 hearing. Staff also intends to appear and speak at the hearing on the issues raised by the hold request. View COGCC rules for hearings. Rules 509 and 510 address objections and testimony at hearings. View COGCC instructions to submit a written statement under Rule 510. 8 North LLC filed two applications with the Colorado Oil and Gas Conservation Commission (COGCC) to establish “drilling and spacing units” (DSU) in the northeastern and southeastern parts of Boulder County. 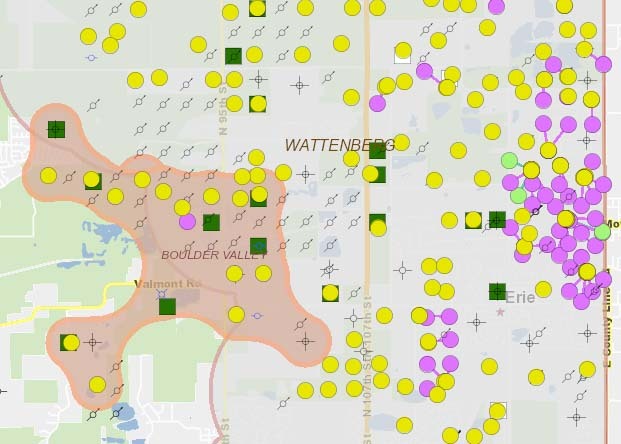 8 North informed Boulder County that it intends to place the 32 wells for the northern unit in Weld County and the 20 wells for the southern unit within the Town of Erie. Boulder County has protested the 8 North applications. These DSU applications were heard by the COGCC on July 31, 2018, as part of the COGCC hearing that took place July 30 – August 1 in Denver. On June 21, 2018, 8 North informed Boulder County, Lafayette, and the COGCC that it intends to place the wells for the northern unit in Weld County and the wells for the southern unit within the Town of Erie. If 8 North follows through on its stated intentions, the surface locations will not be in the regulatory jurisdiction of Boulder County or Lafayette. 8 North LLC filed two applications with the COGCC to establish “drilling and spacing units” (DSU) in the northeastern and southeastern parts of the county. The applications requested authorization to drill a single well in each unit. The same day, 8 North filed applications for “additional density” in each proposed unit, requesting 31 additional wells in the northern unit and 19 additional wells in the southern unit, for a total of 32 and 20 wells respectively. Colorado statutes say that a drilling and spacing unit can be established for a single well to be drilled and begin producing. Only then can additional wells be authorized to prevent “waste” of the mineral resource. Boulder County has filed motions to dismiss 8 North’s applications for additional density, arguing that the COGCC cannot grant them when the drilling and spacing units have not yet been established and the authorized well for those units has not yet been drilled and begun producing. At the same time, 8 North filed motions to dismiss the County’s protests on both the spacing applications and the additional density applications, arguing that the protests did not give enough specific information to support the County’s right to raise issues of public health, safety, and welfare. On January 2 and 4, 2018, the COGCC’s hearing officer issued orders denying the county’s motions to dismiss the additional density applications and granting all of 8 North’s motions to dismiss the county’s protests to all four applications. These orders are considered advisory only, so the county is now in the process of requesting that the entire COGCC re-consider the county’s right to participate in the additional density application hearings as a party. On January 16, 2018, the county filed two Exception Requests with the COGCC, asking that the Commission reconsider the dismissal of the county’s motions to dismiss the 8 North applications for additional wells and the dismissal of the county’s protests to those applications. On January 31, 2018, the hearing officer announced the Commission will hear legal arguments and decide on the exceptions at its March 19-20, 2018 hearing. On March 13, 2018, 8 North agreed that it would not object if the county filed amended protests to the applications for additional wells. Therefore, the legal argument previously scheduled to occur on March 19-20, 2018 is cancelled and the county will be allowed to file new protests without objection. The amended protests were filed March 20, 2018, and will be part of the hearing now scheduled for July 30-31 in Denver. As mentioned above, Boulder County’s initial protest to the 8 North proposed DSU near Longmont was dismissed by the hearing officer. In reviewing pre-existing oil and gas leases for that area, county staff discovered a new legal issue affecting the formation of the DSU and have, therefore, filed a new protest to the northern DSU arguing that it cannot be formed as proposed by 8 North. 8 North argued that the second protest was filed too late. The county and 8 North argued the issue of timing at a pre-hearing conference on April 5, 2018, where the county also asked for special leave to file the second protest if it was necessary. On April 11, the Hearing Officer dismissed the second protest without answering the county’s request for permission. After its follow-up requests for clarification went unanswered, the county filed another exception for review of this latest order by the full commission. 8 North filed a response opposing Boulder County’s exception on May 15, 2018, to which Boulder County filed a reply on May 17, 2018. COGCC scheduled a hearing for the exception on July 30, but on June 6, 2018, 8 North withdrew its opposition to Boulder County’s participation. Therefore, the County will be participating as a protestor to the spacing unit application for the northern unit and the additional well applications in both the northern and southern units at the July 30-31 hearing. On January 31, 2018, the hearing officer continued the COGCC hearing on all four of the applications to the April 30-May 1, 2018 COGCC hearing, and on April 5, 2018 he continued them again to the July 30-31, 2018 hearing. 8 North asked for the hearings to be moved to June in order to have more time to work on specific surface locations. Boulder County objected to a June date because the June 11-12, 2018 COGCC hearing will be held in Greeley. Given that there is significant public interest in these proposals, Boulder County requested they be continued to the July COGCC hearing which will be held in Denver and allows for easier public transit for our constituents. When Boulder County’s request for a local public forum on these DSUs was denied in December 2017, the COGCC commissioners stated they wanted to “have the chance to hear and get public comments” on the 8 North applications when they were up for review in front of the commission. Consequently, the public is expected to have the opportunity to speak on these applications and we will provide additional information on how to participate as soon as it is available. The agenda has not yet been posted to the COGCC website. When the agenda is published, it will list the approximate timing of the hearings on the applications within the two day timeframe. On Sept. 11, 2017, Boulder County learned that 8 North LLC, a subsidiary of Extraction Oil and Gas, LLC, filed paperwork with the Colorado Oil and Gas Conservation Commission (“COGCC”) to begin the state permitting process for oil and gas development in two areas of Boulder County. Boulder County is very concerned about the development contemplated in 8 North’s applications and has reached out to the officials in the affected cities of Longmont, Lafayette and the Town of Erie to discuss a coordinated response. Boulder County will oppose the drilling and spacing applications when they come up for a hearing before the COGCC, which is currently scheduled for July 30-31, 2018, and urges concerned residents to do the same. On October 2, Boulder County and the City of Lafayette jointly submitted a Request for a local public forum on the southern drilling and spacing unit order application, and Boulder County filed a Request for a local public forum on the northern drilling and spacing unit order application. On October 16, 2017, Boulder County and the City of Lafayette jointly filed a Protest and Intervention to the southern drilling and spacing unit (DSU) order application, and Boulder County filed a Protest and Intervention to the northern (DSU) order application. On November 15, 2017, Boulder County and the City of Lafayette also jointly filed a Protest and Intervention to the associated density application associated with the southern DSU, and Boulder County filed a Protest and Intervention to the density application associated with the northern DSU. Information on 8 North’s applications and other updates will be posted on our oil and gas webpage at bit.ly/BCoilgas including information explaining the process for public involvement in the COGCC’s consideration of the applications. Members of the public also can sign up to receive updates from Boulder County via email or text message. On May 2, 2017, the Boulder District Court dismissed the lawsuit filed by the Attorney General, as the issues became moot when the moratorium expired May 1. 2017. The Board of County Commissioners received a letter from the Colorado Office of the Attorney General on Jan. 26, 2017. Boulder County responded to the Attorney General’s letter on Jan. 27.